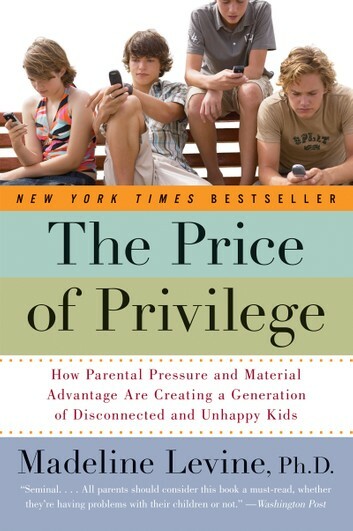 We will discuss Chapters 4 and 5 of THE PRICE OF PRIVILEGE by Dr. Madeleine Levine, one of Challenge Success’ founders. Topics will include: how the culture of affluence works against the development of the self, what is a healthy self, parenting strategies for different ages/stages and social media. Didn’t read the chapters? Haven’t even started the book? It’s okay, come anyway! Bring a friend! This is a supportive group of parents, interested in learning with and from each other. Copies Available on Amazon. Click here! Levine offers thoughtful, practical advice as she explodes one child-rearing myth after another. With empathy and candor, she identifies parenting practices that are toxic to healthy self-development and that have contributed to epidemic levels of depression, anxiety, and substance abuse in the most unlikely place — the affluent family.